During the American Library Association’s Midwinter Conference, join REFORMA for a Night of Stories — Noche de Cuentos — on Saturday, January 26 at the Seattle Central Library. The event starts at 7:30 PM and will feature 3 Seattle-based storytellers. Free and open to the public all Midwinter attendees. 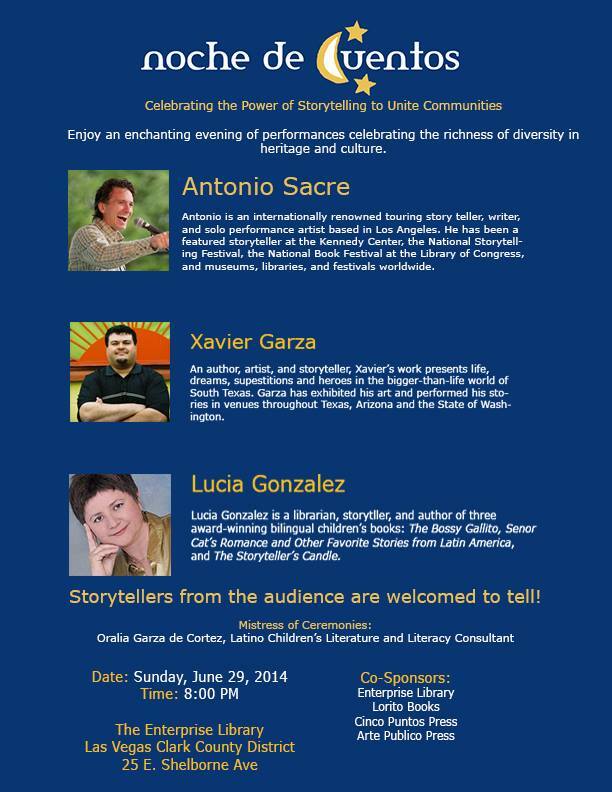 Get ready for a “Night of Stories/Noche de Cuentos” in Puerto Rico! Texas Tech University Libraries and the CH Foundation presented a “Noche de Cuentos” in conjunction with Diversity Week on March 23, 2017. The event was part of a program implemented by Texas Tech University Libraries’ Esther De Leon, Assistant Librarian, and Minerva Alaniz, Associate Librarian. Participants were Dr. Julie Chang, Assistant Professor and storyteller from Texas Tech University and Dr. René Saldaña, Associate Professor and storyteller also from Texas Tech University. A performance by Kalpulli Yaocenoxtli from Minnesota, also graced this wonderful night of stories. Congratulations, Texas Tech University librarians! A fantastic night of storytelling took place during the American Library Association’s Annual Conference in June, 2016. With storyteller and author Lucia Gonzalez introducing the event, a room full of attendees was delighted by stories told by Freda Mosquera, Oralia Garza de Cortez, Nancy Crockford, and Kim Rivers, and a declamation by Jenny Lizarraga. In addition, representatives from REFORMA presented the organization’s awards for Librarian of the Year (LOTY) and Lifetime Achievement Award (LAA) to Ady Huertas and Dr. Kathleen de la Peña McCook, respectively. Time: 8:00 pm. – 10:00 pm. Authors, storytellers, and guests are invited to share and swap stories with the audience. We are working together with REFORMA for the Children in Crisis initiative. We will also be honoring Reformistas Ady Huertas and Dr. Kathleen de la Peña McCook with the 2016 Dr. Arnulfo Trejo Librarian of the Year (LOTY) Award and Elizabeth Martinez Lifetime Achievement Award (LAA) at this year’s event. Join us for an evening of storytelling and celebration with friends and family! Acompáñenos en Noche de Cuentos durante ALA 2016 en Orlando, FL. Cuentacuentos, autores, y otros invitadoes estan invitados a compartir cuentos con la audiencia. Celebraremos a Reformistas Ady Huertas y Dra. Kathleen de la Peña McCook con los premios LOTY y LAA en este evento. ¡Acompáñenos por una noche de cuentos y celebración entre amigos y familia! Special thanks to Cinco Books, INC. Most of the programs that took place around the Nation with the support of this grant highlighted the long history of Latinos in the United States, and its many contributions to culture, history, and all aspects of the communities where we live. As part of their program, the SCF Libraries in Bradenton, Florida, presented film screenings and discussions, an Oral History project, and as culmination of the series, an event to recognize that one of the many ways in which our cultural history is transmitted is through oral narration and stories: a Noche de Cuentos! On March 18, 2016 (the weekend of World Storytelling Day), a Night of Stories took place in the Bradenton Library, with the presence of storyteller Carrie Sue Ayvar. The bilingual stories and interactive character of Carrie’s performance delighted the attendees who gathered around the “campfire” to share stories. Every family present was able to walk away with a free book provided thanks to funds from the grant. The books were part of a selection of winners of the Pura Belpré Award medal or honor. Bookmarks with the list of all the Pura Belpré winners were also provided, and a display of Latino American literature for children, young adults, and adults was enjoyed by those present. A Mid-Winter Night of Stories! A night of stories was the perfect way to relax after a weekend of meetings and sessions in a busy Annual Conference of the American Library Association in Las Vegas, Nevada. On Sunday night, June 29th, those tired but eager to share the power of stories met at the Enterprise Library, a branch of the Las Vegas-Clark County Library District. Thank you to all who attended, to Salvador Avila, branch manager and Trejo Librarian of the Year, for hosting, and many thanks to the wonderful performers: Antonio Sacre, Xavier Garza, and Lucia Gonzalez, along with MC Oralia Garza de Cortes. Noche de Cuentos in Las Vegas! 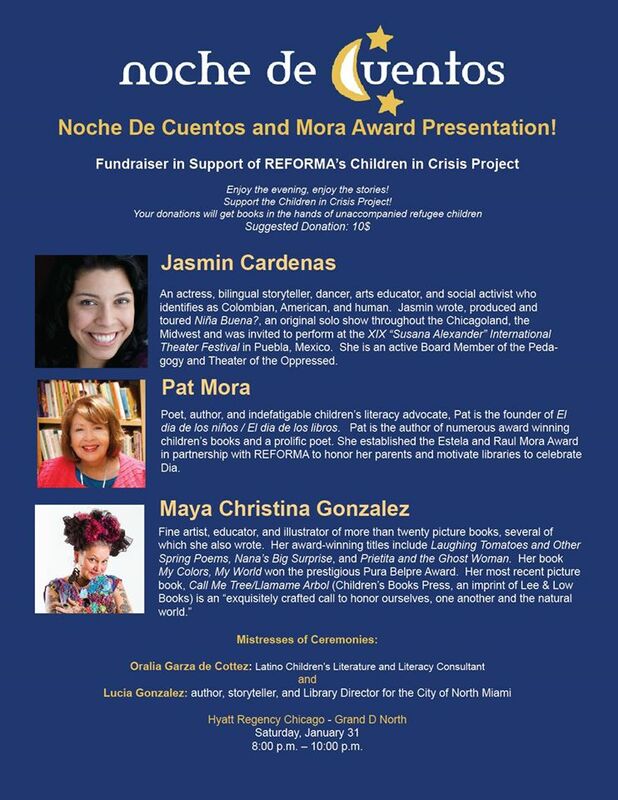 A special night of stories, a Noche de Cuentos event will take place at the Annual Conference of the American Library Association in Las Vegas, in June 2014. Stay tuned for more details about the event, but save the date and invite others to attend! Click on “Noche News” to read more about the different “Noches” or events based on this initiative that are taking place all over the World. REFORMA thanks LORITO BOOKS and INFORMATION NEW WAVE for their support of the Noche de Cuentos initiative and past Mini Grants! Read more in the Mini-Grant page. If your company would like to sponsor this year's Mini Grants, please let us know! Use the contact form to reach us and your Company's Logo could be here! © REFORMA, 2016. All Rights Reserved. Illustrations and artwork by Yuyi Morales, 2010.